신소라(So-ra, Shin). (2018). 데이트폭력 피해 대학생의 심리적 특성에 대한 사례분석. 한국범죄심리연구, 14(2), 47-62. 신소라(So-ra, Shin). "데이트폭력 피해 대학생의 심리적 특성에 대한 사례분석." 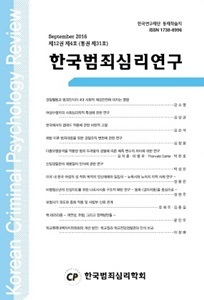 한국범죄심리연구, 14.2(2018): 47-62. 이 연구는 데이트폭력 피해를 경험한 대학생의 상황에 따른 심리적 특성을 분석하여 실질적이고 구체적인 데이트폭력의 예방방안을 마련하는데 목적이 있다. 데이트폭력에 대한 국내의 연구는 최근 들어 양적연구의 증가를 보이고 있으나, 세부적으로 데이트폭력의 피해에 대한 연구는 많이 않다. 더욱 심각해지고 증가하는 데이트폭력의 예방대책을 마련하기 위해서는 데이트폭 력을 획일적으로 정의하여 대처하는 것보다 개별적인 사례와 피해자들의 심리 상태를 살펴보고 실질적으로 데이트폭력에서 벗어날 수 있는 방안을 마련해야 할 것이다. 이 연구는 2017년 10월부터 2018년 3월까지 약 6개월간 데이트폭력의 피해사례를 수집하였으며, 최종적으로 연구대상자 14명을 선정하여 구체적으로 데이트폭력의 피해사례와 폭력사건 전후의 심리상태와 주변상 황을 수집하였다. 수집된 사례를 질적으로 분석한 결과 연구대상인 데이트폭력 피해 대학생이 경험한 폭력의 유형은 정신적, 신체적, 성적 폭력이 다양하게 나타났으며, 심각한 수준의 신체적 폭력도 포함되었다. 또한 피해자들은 데이트폭력에 대한 교육을 받은 경험이 거의 없었으며, 데이트폭력 사건을 경찰이나 가족에게 알리거나 도움을 요청한 경우는 단 한건도 없었다. 대부분 심리적으로 부정적 감정을 보고하였으나 폭력사건의 상대방과 폭력사건 직후 헤어지지 않고 관계를 유지한 대상자도 절반으로 나타났다. 인터뷰에 응한 대상자들 아무런 조치도 취하지 않은 대상자들은 다른 지인들은 물론 경찰기관도 자신들과 같은 생각을 가지고 있을 것이며 그러한 이유로 도움을 요청하지 않았다고 응답하기도 하였다. 이와 같이 데이트폭력 피해 대학생들이 데이트폭력에 대해 심각성을 인지하지 못하는 것은 데이트폭력에 대한 잘못된 인식과 교육의 부재로 나타난 결과라고 볼 수 있다. 소수의 대상자로 실시한 질적분석으로 이 연구에서 인과관계에 대해 논의하기는 어려우나 데이트폭력에 대한 교육프로그램 마련과 피해자를 위한 교육의 실시와 같은 정책의 자료로 활용될 수 있기를 기대한다. The study aims to analyze the psychological characteristics of college students who experienced dating violence and to come up with practical and concrete countermeasures to prevent dating violence. In recent years, quantitative studies of dating violence have shown an increase in number, but the only small number of qualitative research on details of such violence was published. In order to provide effective measures, individual cases and psychological conditions of the victims need to be considered rather than applying uniformed policy. The participants of this study are the victims of dating violence and were recruited from October 2017 to March 2018. The 14 were included in this study and interviewed about dating violence cases, psychological status before and after the incidents, and surrounding conditions of them. A qualitative analysis showed that the types of violence includes psychological, physical, and sexual violence, and had the serious level of physical violence. Also, the only small number of victims participated in dating violence prevention education, and none of them reported to police or family members for help. Even though a majority of the respondents reported negative feelings, half of them did not break up with their partners right after the violent incident. Some participants, who did not take any actions to their victimization, reportedly believed that other acquaintances and police agencies would have the same idea as them and they did not ask for help for that reason. The reason for the low level of awareness of the seriousness of dating violence among college students is a result of their poor recognition of dating violence and insufficient educational opportunity. Admittedly, the size of this study is not enough to draw any causal effect but this study can be used as a reference data for dating violence policy such as prevention education programs or victim education programs.